"fantastic family entertainment - spellbinding even"
"It proves far more enjoyable than I had dared to hope." "Efficient, knowing and highly professional." You think you might know the story of The Wizard of Oz, but the Tony and Olivier Award winning musical Wicked will make you think again. Adapted from Gregory Maguire’s novel of the same name, Wicked retells the events in L Frank Baum’s The Wizard of Oz from the perspective of the so-called ‘wicked’ Witch of the West and Glinda the good witch. In Wicked, the story of Oz as we know it is flipped on its head, so the bad becomes good, and the good becomes an oppressive government regime. The story starts with the friendship between Elphaba the green witch and Galinda when they meet at Shiz University, where they are both new sorcery students. As they grow up, love and politics get in the way as their world heads in a much more sinister direction. Wicked is now widely considered a modern classic, with well-known numbers such as ‘Defying Gravity’ and ‘Popular’. 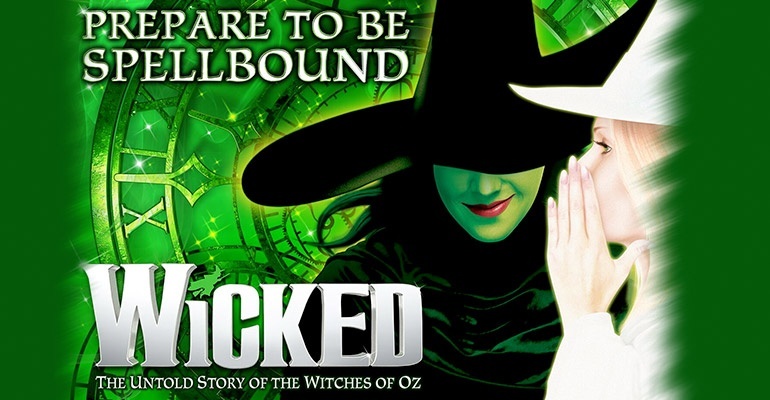 Wicked is recommended for children aged 7+ and is widely adored by older children, teenagers and adults alike. The show is not suitable for young children as some scenes can be scary or violent. Children under the age of 3 will not be admitted into the Apollo Victoria Theatre. The worst experience of my life was in this theatre.The workers were very unpolite and thye didn’t want to find the solution to my mother.She had to go with her wheel chair,we had the tickets and they said that the machine was broken and we couldn’t see the musical.It was horrible and we don’t recommend that theatre and above all the way of working. Was looking forward to seeing the show, based on other reviews and listening to the soundtrack. Attended as a birthday treat on 20 November, but whilst impressed by the theatre and our seats almost in the centre of the Dress Circle, was shocked by the poor quality of the sound. The song lyrics were virtually impossible to hear clearly, and the orchestra at times seemed to be in competition with the vocalists, each trying to drown the other out. Overall a very harsh and distorted sound. Tried to email the theatre to check if they were aware of sound problems on that evening, but there is no contact email on their website. I would be interested to know if this was a one off, or if the sound quality is always so poor. Very disappointed in overall show, but on a positive would say that the lighting and other effects were excellent. The show was spectacular but we nearly passed out from the heat. I thought the other reviews were exaggerating but honestly it was unbearable! I ended up rolling my trousers up and taking my shoes and socks off. There’s also no free water station and they were making a big deal of selling fans which sounded like they cost £10 but I’m hoping I misunderstood! I couldn’t enjoy it - dabbing tap water on my wrists in an attempt to cool down! If they’re trying to make money- turn up the AC and you’ll sell lots of hoodies!!! The show on 1/10 was great. Unfortunately I was sitting near someone who wouldn't stop talking or playing on their phone. My family are here from Australia and we were frustrated that the staff didn't try hard enough to make sure everyone was enjoying themselves. Would see again though if had the opportunity. We went on 4th August, 7.30pm performance. I went with my daughter as a special treat. It was probably about 40 degrees in the theatre. It was unbearably hot. My daughter could not watch the show as she felt physically ill with the heat and thought she was going to faint. She had to leave. aug 3rd 7.30 temp sky high sitting in seat u27 dress circle some sort of fan device behind me,blotting out anything on stage ,sure plenty of water was sold at an inflated price .Sure if you could have measured the temp the show would have been cancelled as unsafe.